Almost half of the acute hospital trusts in the East have been offered incentives by the government to put dying patients on a programme that allows doctors to withdraw treatment. More than 10,000 patients in the region have been put on the Liverpool Care Pathway (LCP) in the last three years, a BBC investigation has found. The programme was designed to ease the suffering of people at the end of their lives, but the Government has ordered an independent review after complaints that some patients and their relatives were not being told they were on it. LCP is approved by the Department of Health, and hospitals say it remains a compassionate approach to end-of-life care. It was designed to ease the suffering of terminally ill patients, but it has become controversial after a number of high-profile complaints about its use, including concerns that clinical decisions could be linked to financial incentives. 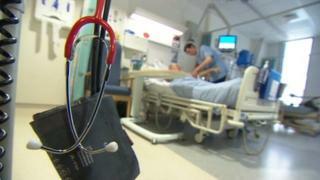 The BBC investigation found that some hospitals were offered money to meet targets in relation to LCP. But the hospitals said the decision to put a patient on the pathway was always a clinical decision, and never related to any financial incentives. About 55,000 people die in the East each year. Half die in hospital, usually with a chronic illness such as heart disease, cancer or stroke. The BBC sent Freedom of Information requests to 20 NHS trusts requesting details about their use of LCP. Only half provided the information, with some saying that they did not collate figures. The investigation found that Cambridge University Hospitals NHS Foundation Trust, which runs Addenbrooke's Hospital in Cambridge, is in line for a £1m bonus from the Government for promoting end-of-life care, including the LCP. The Liverpool Care Pathway allows doctors to withdraw treatment or tests that would be deemed to cause unnecessary suffering at the end of life. The treatment plan aims to allow patients to die with as much dignity and in as little distress as possible. It was developed by Royal Liverpool University Hospital and Liverpool's Marie Curie Hospice. It has been in use since the 1990s and is widely accepted as good practice in end-of-life care. The money is paid if the hospital meets targets in training nurses in palliative care in the eight wards where there are the the most deaths, and in identifying terminally ill patients. The trust said it did not keep figures on the use of LCP. However, a national dying audit, which was a snapshot of deaths, found that only 57% of patients had their care plan discussed with relatives or carers. Since then, the hospital has taken on an end-of-life care "facilitator" to ensure that conversations with patients and relatives take place. East and North Hertfordshire NHS Trust, which runs the Lister Hospital in Stevenage and the Queen Elizabeth II Hospital in Welwyn Garden City, received £180,000 as its incentive to meet an LCP target. It said 1,980 patients were put on the pathway. Denise Charlesworth-Smith, of Norfolk, has become a national spokeswoman for relatives calling for changes to the LCP and will speak at the House of Lords on Wednesday. Her father Philip, 82, died while on the LCP at King's Mill Hospital, Sutton-in-Ashfield, Nottinghamshire. She is unhappy that her family did not know he had been put the pathway, and only discovered after they were handed sponges in order to give him a drink. "If people had explained to families, and probably even the patient, what was happening to them then maybe they would understand it," she said. "If they wanted to then query it and get second opinions, they could." North Norfolk MP and Care Minister Norman Lamb has ordered a national independent review into the way LCP is being operated. A Department of Health spokesman said: "The review looking at how the LCP is being used in practice is to be chaired by crossbench peer Baroness Julia Neuberger. "Following this work, the review will make recommendations about what, if any, changes are needed to improve care, to ensure that patients are always treated with dignity and that, wherever possible, they are involved in decisions about their care, and that carers and families are always involved in the decision-making process."